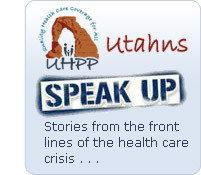 Our aim at UHPP is to explore the full horizon of opportunity to bring accountable care to Utah Medicaid. This concept may have had an abrupt and politically motivated beginning w/Senate Bill 180 and the Medicaid waiver request which followed. Bureau of Managed Care Responses to OIG or Office of Inspector General Suggested ACO Contract Provisions (Source: Utah Dept of Health via SL Tribune GRAMMA request). Medicaid Office of Inspector General Emergency Audit Memo-ACO/MCO Contract Delay (Source: SL Tribune). Taking its cue from Senate Bill 180 (“Medicaid Reform,” by Senator Dan Liljenquist) the Utah Department of Health submitted an 1115 Waiver proposal on July 1, 2011. The waiver has been introduced as the first step in a multi-year process to modernize the way Medicaid services are paid for and delivered in Utah by organizing providers into accountable care organizations (i). ACOs are groups of health care providers who agree to be held accountable for improving health care quality while lowering costs. Utah's waiver proposal needs significant changes—or more in the way of detail—before we can establish whether it is an appropriate first step in the state’s transition to accountable care. For now, the June 1 waiver draft places the "accountability" squarely on the beneficiary in terms of increased cost sharing, penalties for noncompliance (i.e. disenrollment) and drawing clients into private insurance via subsidies. Nothing in the waiver seems to acknowledge the need for certain services, like care coordination, health education, transportation, etc., as necessities to help patients comply with care recommendations. Over the next several months Utah and CMS will negotiate the terms and conditions of the waiver. Now more than ever advocates and providers will need to be in the driver’s seat, to make sure beneficiaries come out ahead in a reform process fraught with danger but also tremendous opportunity for improved quality, lower costs, and better health outcomes for patients. (i) Department of Health (2011). Utah Medicaid Payment and Service Delivery Reform Proposal. http://health.utah.gov/medicaid/stplan/1115%20Waivers.htm.